We just got back from staying in Joshua Tree for a couple of days. Went on day hikes in the park. Have you been there? Wonderful rock formations everywhere. Came back feeling all nature-y and felt like doodling. 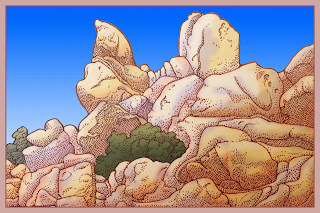 Channeling your inner Jean Giraud. Gorgeous Tom. I never made it to Joshua Tree. If I ever move to Portland Oregon , I'lll treat California like I was a rabid tourist. See all of it. Neat enhanced doodle. The tree insertion is a nice composition note. I guess Joshua Tree has lots of that great sandstone rock found in places like Simi Valley and Vasquez Rocks. I saw Tulsa today from a turnpike. No rock formations. Lots of rain fed green. You could get very Old Ones anxious looking at some of the overgrown wooded areas. Good critter habitat. Now I see figures in the rocks. The top saddleback being a sort of little Nemo configuration. Figure laying down for a nap. A Robot head. Time to do a Hidden Pictures for Highlights. Joshua Tree is great...haven't been out there for ages. As teenagers we used to go rock climbing in the park quite a bit. Good clean fun, with the potential for life-threatening injuries. I used to take the 8mm film camera along with us and make silent movies. Good times indeed!! But most importantly, glad you felt inspired!